"This was my Mom's favorite seafood recipe, she is now 88, I am 60 and this is my all time favorite seafood recipe also. I have had guests, who, when invited to dinner, specifically request this to be served." In a heavy saucepan, melt the remaining 1/2 cup butter over low heat. Stir in remaining 1/2 cup flour. Cook and stir constantly for 1 minute. Gradually add the milk plus the 1 cup reserved cooking liquid. Raise heat to medium; cook, stirring constantly, until the mixture is thickened and bubbly. Mix in the shredded Cheddar cheese, vinegar, Worcestershire sauce, salt, pepper, and hot sauce. Stir in cooked seafood. Preheat oven to 350 degrees F (175 degrees C). Lightly grease one 9x13 inch baking dish. Press crabmeat mixture into the bottom of the prepared pan. 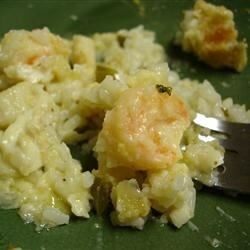 Spoon the seafood mixture over the crabmeat crust, and sprinkle with the Parmesan cheese.